DO NOT TOUCH!!! EXTREMELY DANGEROUS! CALL US! The garage door is usually the heaviest moving item in a house, sometimes weighing as much as 300 to 400 pounds. This creates a safety hazard, especially for children who are smaller and may not be aware of the dangers. Most injuries involve fingers or hands caught between the door sections as they close. Children or animals can also be trapped under a closing door. No one should stand, walk, or run under a closing door. Adults should model this behavior as well and provide a good example. Never play under or near the garage door. Children should know to go for responsible, adult help when assistance is needed. However, when children reach an age where they can responsibly learn, they should know how to use the emergency release in case someone is pinned. Determining an appropriate age for this is difficult, since all children mature, are physically capable, and take responsibility at different ages. Install garage door push buttons at least five feet above the floor, out of reach of small children. Garage door openers manufactured after Jan. 1, 1993, are required by federal law to have advanced safety features. These openers have an automatic reversing feature that reverses the door if it comes in contact with an object while closing. 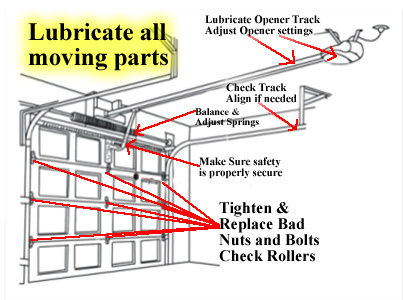 If your garage door opener does not have this feature, consider replacing the opener. If it does have this feature, test it regularly by placing a 2x4 flat board on the ground and close the door. If the door does not reverse, hire a qualified individual to adjust or repair the door opener or door. Visually inspect the garage door springs, rollers, pulleys, cables, and track on a regular basis. Look for loose or worn parts. Do not attempt any maintenance around the springs. The springs, their mounting brackets, cables, and other associated hardware are under high tension. If a part were to break or come loose, it could cause serious injury. Your garage door is an investment that requires proper maintenance. Let our trained technicians take care of all your garage door needs. We will perform a multi-point inspection and check to see if your door is balanced and aligned. Our maintenance services include tightening all nuts and bolts, replacing bad ones, and lubricating door hardware such as rollers, springs, hinges and the garage door opener. All parts of your garage door opener experience wear and tear including the track, belt, chain, or screw drive, circuit boards, gears and motor. Our multi-point inspections also include checking these different parts to ensure everything is operating smoothly. Although commercial doors are designed to handle repeated use over time, the hardware will begin to show signs of fatigue. We will inspect hinges, rollers, springs, tracks, openers, and its balance. We also check roll up commercial doors. Save time and money with preventative maintenance on your overhead doors and openers. Contact us today for a multi-point inspection!